A very sharp learning curve! Work with the Jumbo had been at a kind of impasse of late as I tried to figure out why the rods wouldn’t behave correctly when power was applied. I tested first the rods (as four coupled units) then as this still showed the problem I decided to pay attention to the bearings with their massive slop. I decided to replace them but then became unhappy with the frames themselves. When I offered them up to the jig again there was still a lot of slop in the bearings and I decided to unsolder them and try to reset them on the jig. Just out of curiosity I checked the manual for the jig and, BANG, the realisation dawned; the mock axles on the jig are 1/8″ diameter. 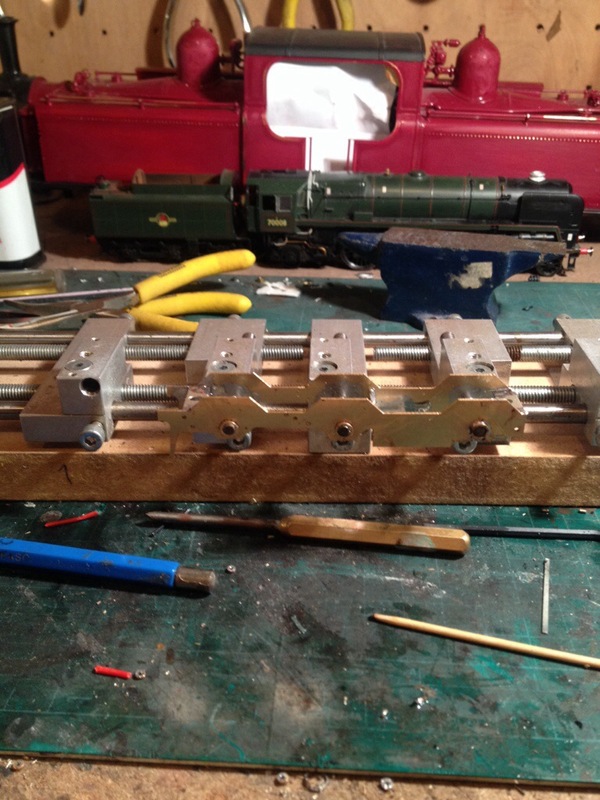 Guess who was using 3mm diameter axles on the loco! Cue a Homer Simpson moment. I had been a little unhappy about the fact I had been producing new rods for a previously built chassis whose spacings had been altered in between times so I bit the bullet and dug out a spare set of frames which had been hanging about since 2009. Using the fresh bearings and Comet EM spacers I quickly knocked up a new chassis which also now has somewhere to mount the pick-up plate! This model has made similar progress to a wee drunk man on a Friday night; one step forward, two back but I don’t care, I’m in a good mood and I know at least that it’s all going together correctly this time. Culreoch WILL see that ‘Doonhamer’ Jumbo in service soon enough! All the same, isn’t it time the Imperial measurement system was carted off to an honourable retirement? Metric is so much more logical! Who’s the green lady visible in the scenery, bro? That, mon brave, is 70011, now receiving economy green and her new identity!